You've invested a considerable amount of time and money into your arena. You should protect this investment by keeping the arena safe, comfortable and in tip-top shape. A riding arena that is properly cared for will empower your horses to perform their best. There are several ways to maintain your arena. Your maintenance needs will differ based on factors like daily use, footing material, your riding style and weather. Follow this guide to keep your arena in top-notch shape. Elite arenas are built with three layers. The bottom layer, known as the sub-base, is native soil that is leveled and graded before being compacted. The middle section is the 6” base comprised of a compact material like crushed rock. A well-maintained base will keep the footing that rests on top in sterling condition. The top layer should be a softer material free of dust (like sand, wood shavings, rubber, topsoil or sawdust) that provides your horses with traction and cushion. A well-maintained base will last you a decade. Failing to water and drag, however, will significantly decrease the base's lifespan and compromise the quality of the footing above. To water your base, simply attach a sprinkler head to your hose and give the footing an even coating of water. You can also buy watering systems to get the job done faster. You'll want to water your base regularly to keep it soft and pliable. How often you need to water depends on how often you ride. If you ride once a day, for instance, you'll likely need to water once a week. If you only ride a few times a week, you can go longer between regular waterings. Weather also plays a factor in watering, as dry, arid regions like the Texas Panhandle typically leave the soil drier. Dragging means moving footing to the position where it should be. If your arena is small, you can do this by dragging a hand-held arena rake. If your arena is larger, you'll likely need heavier equipment. Arena drags come in a variety of sizes. 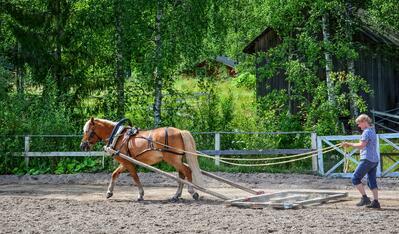 When you pull an arena drag with a tractor, their teeth spread out the footing, repositioning the layers. When you use a drag, be sure to avoid touching the base when dragging. If you rip into the third level of the footing, you can cause unevenness and divots. These flaws can only be remedied by stripping the footing and leveling the base all over again, a timely and often costly process. You should drag as often as you water – preferably before you water, as liquid makes the footing tougher. Dragging on a regular basis keeps the material from compacting, which will make running more enjoyable for you and your horse. If storm clouds are on the horizon, you need to do more than grabbing your umbrella. Experts recommend smoothing out the footing before storms hit to keep the water from forming puddles in the arena. You'll also need to wait for the footing and the base to dry before you ride again. 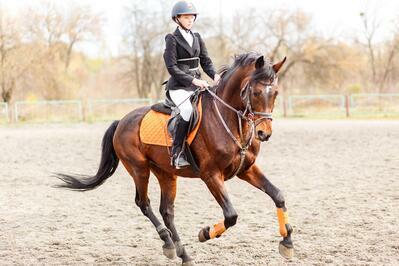 Riding on a wet arena is dangerous both for your horse and for the footing. It can tear up your base, damaging the integrity of your arena. The Texas Panhandle is known for some extreme weather, so keep an eye on the weather forecast for incoming storms. If your riding surface isn't coated with wax, it will likely require additional maintenance. Make use of an irrigation system so the surface doesn't dry. If your riding surface is waxed-coated, it will be free of dust and tolerate alterations in temperature. As a result, you shouldn't need an irrigation system. Eliminate all organic matter like leaves and droppings from the surface. These substances have the potential to dry out waxed surfaces. Also, don't drop the tines too far when grooming the arena. If you drop them deeply enough, they might damage the underlying base. Keep the surface evenly compacted and level at all times. If dips or tracking occur, remedy them with hand raking before grooming the surface. Pay particularly close attention to high-traffic spaces like entryways and tracks that are used at a high frequency. These areas are prone to compacting down. Handle traffic wear right away when you can. Make sure your horses have clean legs and feet before hitting the arena. Don't forget to pick horses' feet before they leave the arena, as well. You should also clean tractor tires before grooming so the footing isn't compromised by materials from outside. Depth checks should be performed on a regular basis to determine if there are inconsistencies. Check the arena every couple of months with a probe. Measure depth around the entire track as well as the three-quarter, center and quarter lines. Want to learn more about arena footers? Download our free white paper!